I started to post about day two of our New York trip, and realized that we did not take any pictures on day two!! GAH! Soooooo, I'll tease you with a shot that should have been on the post of day three. Confused? I sure am. 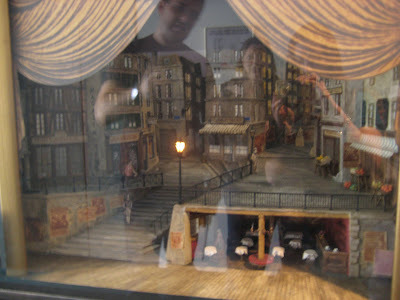 This is a model of one of the sets at the Metropolitan Opera. It shows the versatility of the stage, and the many ways it can be configured. Day two had us running all over the city. We started out at West 85th with a tour of Mannes School of Music...a very tiny conservatory, with a 2:1 student-teacher ratio. There were three students on the tour. We then ventured across town to East 4th tour NYU...a very large university, with a student population triple that of the county in which I reside. There were so many students on the tour that they were divided into eight groups. Dinner was fantastic, Ed's wife was adorable, and, as usual, the evening ended sooner than we would have liked. We said our good-byes, and headed back to the hotel. No one had ANY trouble falling asleep after such a busy day! Are you beginning to get the idea that we LOVED our trip to the city??? I can't wait to see where Snow White decides to go to school. I take it she's a music major. Next trip to the Big Apple, I'm coming. Okay? GJ - She's a soprano who wants to be an opera singer. She'd prefer to begin her career at The Met!!!! TIW - You got it!!! Sounds like a great 2nd day...but no pictures? Are you ok??? May God lead her to where she needs to be. I am praying for all. WOW!!!!!! Julliard? Girl, you must have some major talent going on in your house. What an exciting trip you had, and it isn't over yet (for us). The person who lives in a place where gourmet is 7-11 nachos would like to know what was on the meny at these restaurants, just so I can dream about food that isn't deep fried or out of a bag or can. Do we get to go to the Statue of Liberty on this trip? ARe we there yet? Oh, the drama! Heading off to school, trip to the city, plotting for the future! Your hands are full! I can't wait to read on! I know it's bitter sweet for you and CB. Wow, it'll be hard to let her go. Phew...I too will have to go through it someday. Glad you all have had a nice time together. Why doesn't Snow White consider University of Oregon? That way you and CB would be forced to come out to the West Coast and have dinner with Predo and me? Okay? Okay! This is exciting! Opera??? Well who knew? She will SHINE wherever she goes. Julliard sounds wonderful....but 6% admission is tough. My oldest has dreams of Oxford (yeah, the England one) or Princeton. I keep telling her it's better to be a big fish in a little pond than a little fish in a big pond...(not to mention momma's pocketbook can't take the big pond!) but at least they're dreaming and reaching. God will put them where they need to be! The college tours, the dinner with an old friend - how fun! Six percent of applicants at Juilliard?? Wow. I was not there and the pictures get me giddy! :) Lots of fun! I'll be watching for an update! I recently heard that Mannes is excellent .. Julliard is the crown jewel .. I hope she gets into both! Did Someone Say "Free Chocolate"?